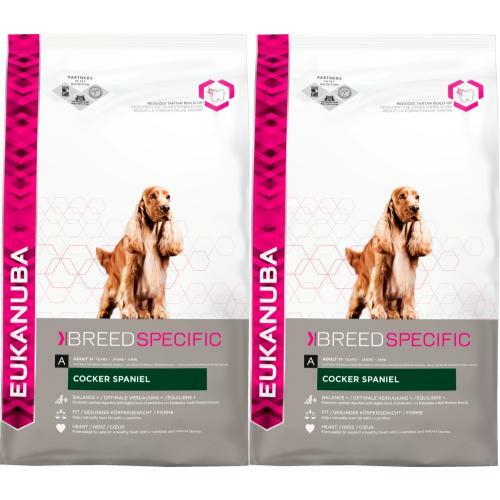 Eukanuba Cocker Spaniel is the ideal way to provide your adult Cocker or Springer Spaniel with balanced, breed specific nutrition. A complete dog food with a lower calorie content and increased L-Carnitine to help your Spaniel achieve and maintain a healthy weight, reducing stress on your bouncy, active pooch’s joints. With high quality animal protein rich in naturally occurring Taurine, Eukanuba Cocker Spaniel is perfect for supporting a healthy heart, whilst a higher level of natural prebiotics stimulate the balance of friendly bacteria in your dog’s tummy for an optimal digestive system. Working on the outside as well as in, the delicious kibbles are loaded with Omega 3 & 6 fatty acids to nourish your Spaniel’s skin and soft, shiny coat. Protein 27.0%, Fat Content 12.0%, Omega-6 Fatty Acids 2.07%, Omega-3 Fatty Acids 0.35%, Moisture 8.00%, Crude Ash 7.40%, Crude Fibres 2.60%, Calcium 1.35%, Phosphorus 1.00%.